Please note: The "active content" on this JMI web site simply enables use of the drop-down menus for ease of navigation. "Sam has such a beautiful voice and sings with so much soul. I've seen him perform live a few times and he's amazing"
but with subtle delicacy too...I think this guy is absolutely brilliant"
in British acoustic roots music. Seriously...Check him out!" "The Lost Boys is an outstanding debut album." The Lost Boys is going to be huge." Sam's debut EP - entitled 'Your Way Home' was released in March 2013, which swiftly created a buzz of interest in the folk scene for Sam's music. He followed this up with the release of the widely acclaimed 'Spokes' EP in February 2015. This cemented Sam's place further as one of the most exciting young prospects in the folk scene - landing him a nomination in the Best Singer category at the 2015 Spiral Earth Awards, and grabbing the attention of BBC Radio 2's Folk Show. Touring as a trio with Jamie Francis (banjo) and Evan Carson (percussion), Sam has gained a reputation for an incredibly high class and dynamic live show, and the guys are rapidly becoming firm favourites at venues and festivals in all parts of the country. After a barnstorming performance to a completely rammed Club Tent at Cambridge Folk Festival 2015, the guys were invited to play their first session on Radio 2 live from the festival. Not content with resting on his laurels, Sam enlisted the extraordinary talents of new band members Ciaran Algar (fiddle) and Graham Coe (cello) and went straight back into the studio to record his debut album. 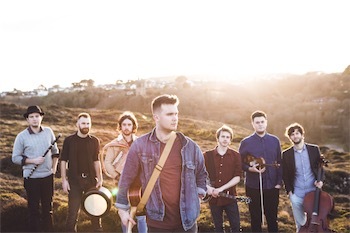 'The Lost Boys' came out in November 2015 to a storm of rave reviews, cementing Sam's place as one of the most rapidly rising stars on the UK folk scene, and enticing Radio 2 to invite the guys into the BBC studios as the featured live session guests on the Mark Radcliffe Show - an honour usually only bestowed upon much more established musicians. The album has also been championed by numerous legends of folk broadcasting, including Mike Harding - who played tracks from the album for four weeks in a row on his online radio podcast. Sam is taking the album on tour throughout 2016 with the full album band, aptly named Sam Kelly and The Lost Boys. Coming from a family largely made up of Norfolk dairy farmers has left Sam with an unmatched experience of singing in front of hurtfully disinterested Friesians, and his meandering musical journey has ranged from reaching the final of ITV's Britain's Got Talent as a teenager, to being selected for the first ever EFDSS Artist Development Scheme. Whether playing to 13 million people on prime-time television, or to 10 people in a tiny pub, Sam's child-like fascination with music shines through, and his passion for discovering and rekindling the sounds of his musical heritage has gained him the respect of peers and audiences worldwide. See News page for more JMI news.